I love the experience of living in a different country and seeking out the similarities and noticing the differences. China is a vast land and we’re in a droplet of its ocean but even so, there is so much that is new and exciting. I have written about my teaching day but that is only half of my time here – other half is shopping, parks and hopefully travel. And noticing China! 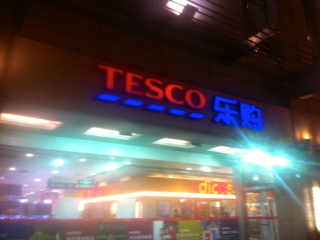 Seeing Tesco for the first time was a shock – I never much cared for Tesco in the UK but now I suddenly felt like it could become my favourite shop (although ‘Jusco’ and Ren Ren Le are also firm favourites!). The first thing I notice when we walk through the entrance or any supermarket is the overwhelming smell of the durian fruit. Some poeple swear by its delicious-ness and others detest it. Me? I like it freeze-dried but can never bring myself to eat it fully because the smell really does get in the way for me! Why is it so stinky? Does it only smell like rotten custard to some and like flowers of the earth to others? I know that in time I will try some durian flesh and they are in abundance here… so let’s move onto something else I didn’t expect (although, why not?!) – IKEA. We went on a trip to IKEA, organised by the school. The ‘social committee’ like to make sure that people are bonding and are enabled to get to places to see new things and get various bits and pieces for their apartments – another perk of the job! Some of the ‘new hires’ and their families boarded the bus and made the 45-minute journey, chatting all the way, past trees, homes, broken roofs, shacks and pools of water, dragonflies and tall buildings… then suddenly, the familiar blue and yellow building that we once used to grace twice a year in Milton Keynes, England came into view. The lay out was exactly the same. The goods were the same. The prices were pretty much the same (although I am sure a few things were a bit cheaper). The one major difference was how people interacted with the IKEA furniture. For example, in the bed section, people were actually sleeping in the beds. In the UK, you see people glancing around cautiously to check no-one’s looking before they have a cheeky lie down and then get up as if nothing happened with a slightly reddened face! (just me?!) Here, EVERY bed was occupied!! In one large kingsize bed in the showroom a family of three had settled down and were looking very cozy indeed! I gestured towards the woman to try and communicate the idea that it was comfy in there, no? She eventually smiled and patted the bed and opened the duvet – do I want to get in too?!!! On another bed a man was asleep – properly asleep and out for the count! We then reached the section where the show-room lounges are. The TVs were on and the families were chilling out, watching full-shows and films! EVERY single couch was occupied! I wondered how many people would make a purchase at the end of the day. My friend told me that last time she visited, in the kitchen and tables showrooms, families were in there having a proper lunch! I think it’s so lovely – that same unreservedness that I saw in the stadium on our first night here where about a thousand people, all different ages were dancing together and walking around, playing and being happy together! So more things I have noticed… The Chinese LOVE their fireworks! There are daily fireworks here (even at half seven in the morn – the Chinese invented gunpowder and they make the most of every opportunity worth celebrating to let them off!) We have heard fireworks every single day since we arrived. We had our own window display this evening from our daughter’s bedroom – the perfect place to be for such an impressive show! People nap everywhere and anywhere. In the mall on the soft seats…in IKEA… I love it! The world is our home, right?! And if we’re tired, we should nap, yes?! Well… I know that wouldn’t go down well in my home-town. If you were to start sleeping in the local shopping centre there, you’d soon be moved or someone would step on you on purpose – I am sure of it! Cicadas are NOISY! There are ciacadas in the trees here and they make the most magnificent racket. It’s almost like they are electrical. And what I have noticed is that you can’t see them. I stood for AGES once peering upwards into some trees, adamant that I’d spot one, but no joy. The noise goes in waves too. They start making the noise then suddely the noise stops completely and then the next set starts in the neighbouring trees… do they die? Or are they taking a break? I have got used to them now – you hardly ever see them out of the tree and they are harmless beetle-like creatures, with a shiny body (I think!!) The cicada season is now over – one day, they just stopped making their noise and have been replaced by chirping crickets. Since we got here, we have had many blue sky days! Yes, the pollution here is not great – but it’s better than it was ten years ago, our new friends say. And this area in particular (as well as the rest of China I think) are making great steps to improve air quality. I have had NO problems with my breathing since I got here – in fact, I have been better than ever with asthma – miracle! People will leave rubbish out – lots of it… then someone WILL come and clear it away! Where we are living in China is developing so fast and buildings and malls are springing up everywhere – it’s clean here in many places and dirty and broken down in others. The dust is not something you see much of, except on windows and buildings – I really thought I’d be gasping for breath, but it feels good here. We walk in the greenbelt strech of park outside our new home here and it’s lovely. I have noticed that we are generally the only non-Chinese people when out and about. In the malls, we get a lot of stares and loads of smiles. People don’t usually greet us first, but I am greeting almost every person I meet here! I do that in the UK too and I don’t care what people say, nearly everyone loves a happy greeting! Well the Chinese are no exception! So I say very enthusiastically, ‘Ni hao!’ to all I cross paths with, and they look SO happy that I have said hello, and will usually reply with another ‘Ni hao.’ I love this language and cannot wait to learn more! I can’t figure out how to add the little hats and accents to the words but here are some more things I can now say! I can also ask how much something is but I am not sure how to write it in Pinyin.